The holidays bring a unique set of challenges to home business owners. You may be crazy busy with your business or it may slow down and cause you to worry about money. Your customers and clients may become more demanding as they try to finish things up before the holidays. And then there’s all of the holiday prep: decorations, gift shopping, gift wrapping, cooking, cleaning, prepping for guests… It’s enough to fill even the most stalwart home business owner with holiday dread. But there are things you can do to decrease your pre-holiday stress and overwhelm and get back to actually enjoying the holiday season! Here are 10 Holiday Survival Tips for Home Business Owners! Ideally, the holidays are a time for fun and family, but for many of us, it’s the busiest time of year. Between holiday prep and keeping our businesses afloat through the holiday season, this time of year can become more of a drag than a time for celebration. Let’s talk about 10 Holiday Survival Tips for Home Business Owners. Christmas is officially 7 weeks away. Did your stomach just dip? Mine did! What do you need to get done in the next 7 weeks? What has to get done before the evening of the 24th? Make a list! Dump all of the to-do’s out of your brain! Get out a timer and a notepad and write for at least 15 minutes. Consider all areas of your life: home business, mother/father, friend, church, groups, extended family, etc. Lay out all of those to-do’s, so that you can make a plan. Now categorize your list by weeks using numbers 1-7. What needs to be done in Week 1? What needs to be done in Week 7? And what needs to be completed in all of the weeks in between? Now, you have a plan! I talk more about brain dumps and making a plan in this post: 6 Things To Do on Sunday for the Best Work Week Ever. Each week, look at the list you created in tip #2 and add that week’s tasks to your planner or daily to-do list. 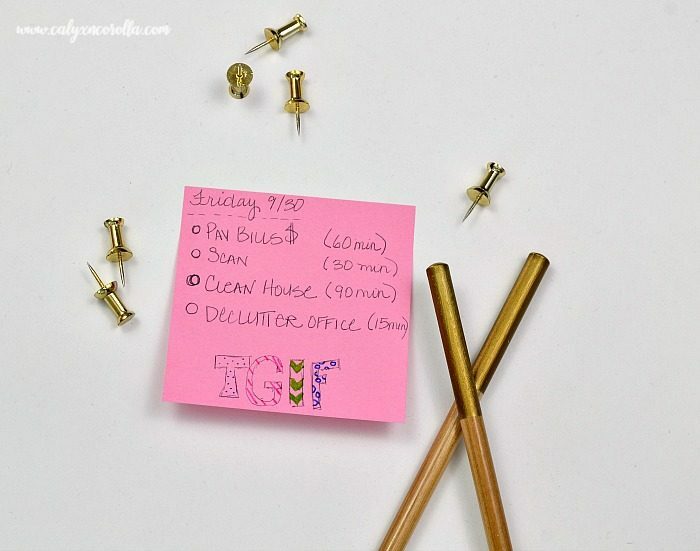 It works best for me to plan on getting one task done per weekday. Routines – Creating a routine is a simple way to get more done in less time. By establishing a routine, tasks become habit. Not only do we avoid fighting with our inner voice who just wants to have fun, we do the tasks the same way every time, so they get done faster! Start each week with a brain dump where you record all of the things you need to get done in the coming weeks, then prioritize it to find the most important and most urgent tasks. 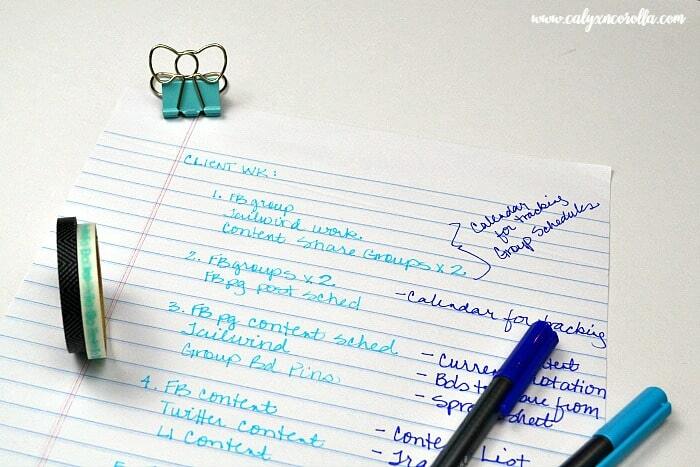 Find more tips for writing a better to-do list and getting those to-do’s done HERE! We live in a world where multitasking is cool, but in reality, multitasking crushes our effectiveness. Scattered and distracted are the enemies of working smart, so turn off those notifications, close your extra browser windows, get a timer, set it for 15-30 minutes, and FOCUS on one thing! Your child’s teacher wants you to bake cupcakes for the whole class. What do you say? No (But maybe you say you’d love to help around Valentine’s Day)! By saying no to things that don’t fit with our priorities or that don’t excite us, we can say yes to those things that really matter to us. It’s also a great time to learn something new. 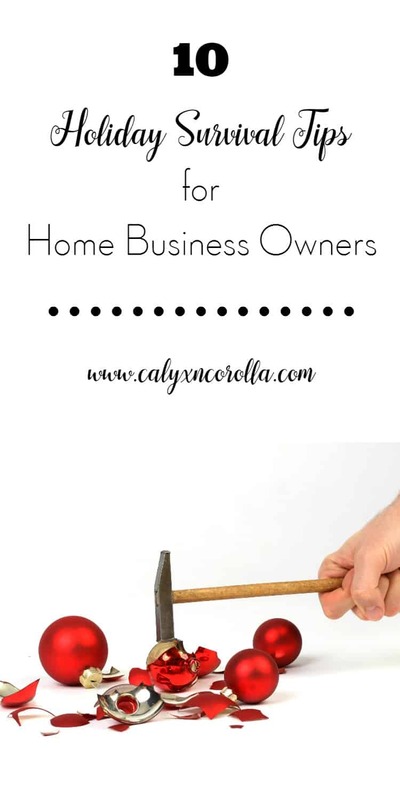 Check out my book recommendations for home business owners HERE! Hire a babysitter for a few extra hours a week. Hire a Virtual Assistant. Learn more HERE! Trade your organization skills to your friend who is an amazing cook. You get frozen, home-cooked meals, and she gets a newly organized home office! Talk to your friends and neighbors. You might be surprised at the mutually beneficial arrangements you can make during a conversation. Get your kids involved in your home business. Learn more HERE! It’s tempting to burn the candle at both ends during this busy time of year, but that also means you run the risk of burning out. Set strong boundaries regarding things like quitting time, client phone time, taking on additional work, and taking on additional responsibilities. Take a little time off and enjoy your family and friends during this special time of year. Schedule an hour in the afternoon for a cup of tea and reading a few pages in a good book. Or take some days off. Or both! Your work will be there waiting for you, and you’ll come back to it refreshed, excited, and filled with a renewed creativity! I’m always amazed at the power of gratitude. It affects my perception, my attitude, my facial expressions, and my health. Express a little gratitude every day and truly experience the beauty of this season! For us, this time of year is all about family, fun, and traditions. There’s our Solstice Elves tradition where we draw names and spend the two weeks before Christmas doing kind and considerate things for each other. We all look forward to our Christmas Eve dinner when my husband cooks a favorite food for each family member, then we play Monopoly into the wee hours of Christmas morning. Watching uplifting Christmas movies as a family, baking cookies and sharing with the neighbors, enjoying popcorn and hot chocolate while we drive around and look at lights…. So, those are my 10 holiday survival tips for home business owners. Let’s make a pact to not only survive this holiday season but thrive during it! Hello, I’m Tiffany, the blogger behind Calyx and Corolla. I’m a fan of organization, working at home, and office supplies. Over the past 15 years, I’ve honed my organization & time management skills while running businesses at home, and I’m sharing all of my tips, tricks & secrets! You can also find me on Facebook, Pinterest, and Instagram. Hi, Jenny ~ Just wanted to pop in and say “thanks again” for having me as a guest contributor to The Melrose Family! I always look forward to this part of my schedule. 🙂 Hope your day is off to a great start!